Uptown incubates the home-grown, artistic, and entrepreneurial spirit unique to Oakland. 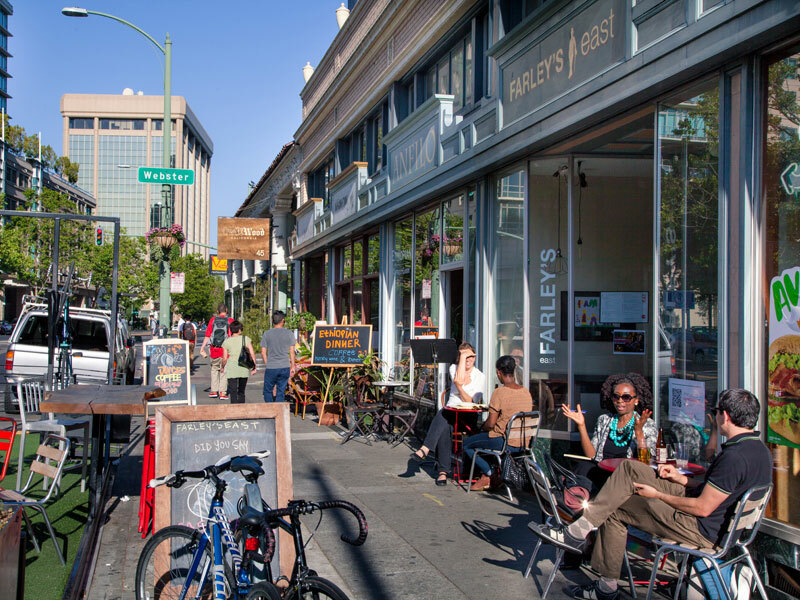 The neighborhood has experienced significant revitalization over the last 15 years, transforming an area dominated by underutilized parking lots into the Bay Area's premier arts and entertainment district. The neighborhood was officially designated as the "Arts and Entertainment District" by the City of Oakland in 2009. Bounded by Grand Avenue to the north, 14th Street (to Jefferson Street) and 17th Street (to Telegraph Street) to the south, the I-980 freeway to the west and Telegraph Avenue to the east. Uptown Art Park. Photo courtesy City of Oakland. Uptown is home to numerous performance venues such as the eclectic Fox Theater, the Art Deco–inspired Paramount Theater, the New Parkway Theater, and the New Parish. Cultural events take place each month, thanks to the collaboration of 40 local galleries, artists, and mixed-use art spaces. A few of the signature events include the Oakland Art Murmur First Friday Art Gallery Walk and the Oakland First Friday Festival, which draw crowds of 20,000 to the neighborhood. 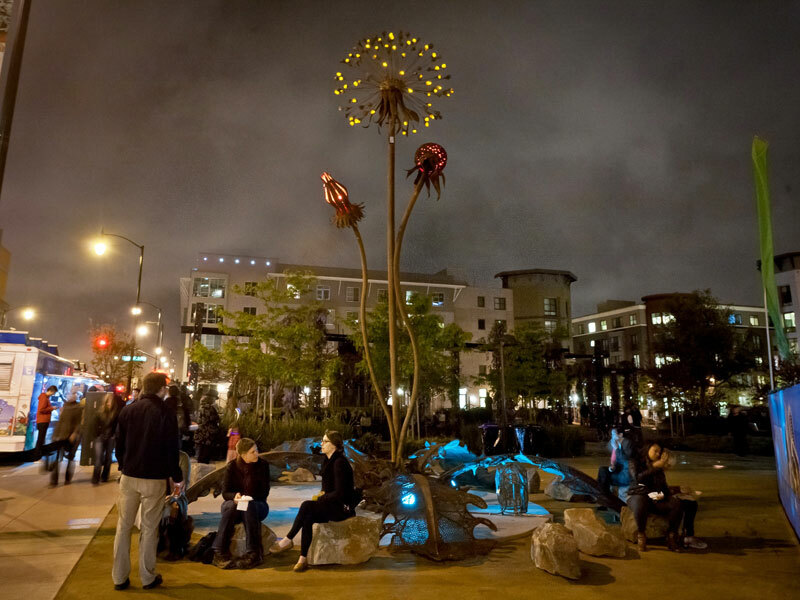 Uptown boasts a wealth of public art, such as the recently completed topographical wall sculpture featuring color-shifting LED lighting created by nationally acclaimed artist Dan Corson, located at the 19th Street Bay Area Rapid Transit (BART) exit, and other sculptures in Uptown's Art Park. During the mid- to late 2000s, the Uptown Residential Project served as a major catalyst for private investment and job creation in the Uptown District. Part of former Mayor Jerry Brown's 10K Housing Initiative, the Uptown Area Residential Project embodied values of both the city and local residents. Phase I entailed cleanup of a brownfield site, and 20 percent of the units were affordable to households earning less than 50 percent of area median income. Phase I received LEED Silver certification. Phase II, spearheaded by the Coalition for Workforce Housing and 15 other community organizations, was a 100 percent affordable housing development for households earning less than 60 percent of area median income. The project design took advantage of its proximity to public transportation and created a transit-oriented, pedestrian-friendly neighborhood with a variety of housing options. A 25,000-square-foot public park is located at the center of the project and serves as the focal point of the neighborhood. The New York Times ranked Uptown number 5 on the "45 Best Places to Go in 2012." The neighborhood is distinguished through the dedication of its residents, concentration of arts, culture and entertainment venues, restaurants, bars, and well-preserved historic buildings, all within close proximity and with easy access to transportation. Transit options are plentiful for residents, including two downtown Oakland Bay Area Rapid Transit (BART) stations, numerous AC Transit bus lines, free weekday shuttles, Greyhound bus stops, and close proximity to all of the major freeways. 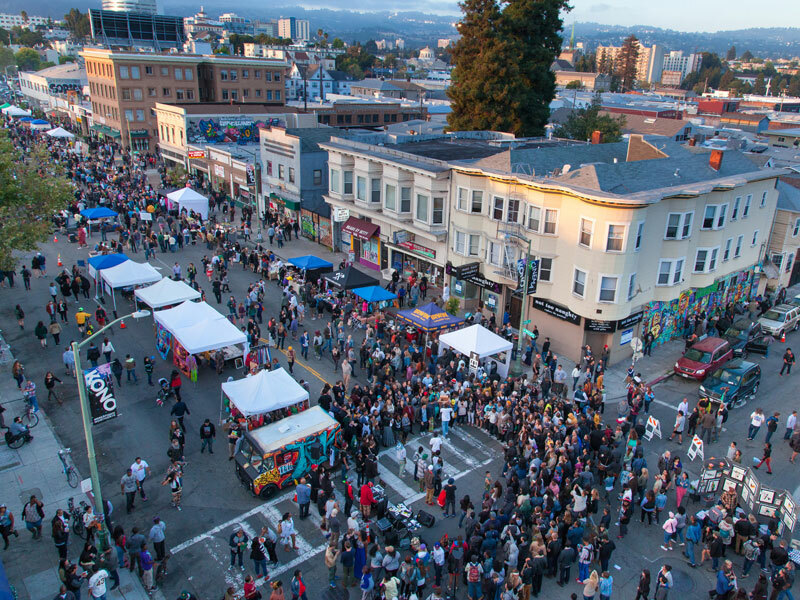 Aerial view of Oakland First Fridays. Photo Greg Linhares, City of Oakland. The OAM led to the creation of the First Friday Art Gallery Walk in 2006, when all participating spaces held concurrent receptions; this is now a hybrid event with 40 participating galleries and mixed-use arts spaces, attracting 20,000 visitors to the event officially called "Oakland Art Murmur First Friday Art Gallery Walk"
Oakland's Uptown District. Photo Greg Linhares, City of Oakland.